The structures of the data within a database can be viewed in two ways, physically and logically. The physical data structure refers to the physical arrangement of the data on the secondary storage device, usually disk. Typically, this physical structure is the concern of specialists who design DBMSs. Analysts, programmers, and users are generally less concerned with the physical structure than with the logical structure. The logical data structure concerns how the data "seem" to be arranged and the meanings of the data elements in relation to one another. This structure, or model, is generally defined in terms of a schema- an overall conceptual view of the logical relationships between the data elements in the database. It includes the names of the major elements, their attribute, and the logical relationships between them. 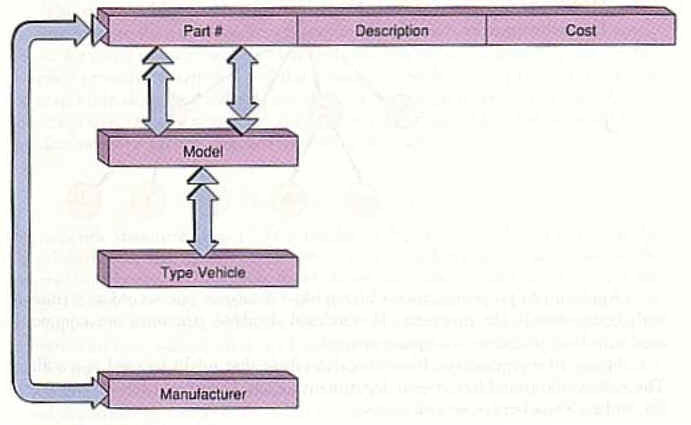 The figure below shows a schema that might apply to database of an autoparts store. Although greatly simplified, it illustrates that relationships exist between part numbers, types of cars, models, and manufactures. The connecting lines indicate links and the arrows the type of relationship. For example, in this schema, manufacturer is linked to part number, and the relationship in one-to-many (a double-headed arrow implies many and single-headed arrow one). That is, one manufacturer produces many part numbers, but each part number has only one manufacturer. There are also indirect links indicated. A part number, for example, is linked to type of vehicle through model. In a large database, the relationships are far more complex than those shown. Typically, each user or applications program is concerned with only a small part or subset of the data elements in the schema. The subset of the database schema required by a particular applications program is referred to as a subschema or users� view. The subschema of a payroll program would be different from the subschema of an accounts payable program, and so on. This logical arrangement not only clarified the user�s view of the database but also serves to enhance data security by providing access to limited data elements on a need-to-know basis. A programmer working on an inventory program, for example, would have no need to access employee salary data.